The most extensive and varied collection of primary sources available. 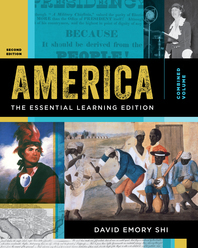 The Essential Learning Edition of America’s celebrated narrative offers a unique pedagogical program built around core objectives. In-chapter features guide reading, source activities guide analysis, and digital resources reinforce the reading and skill development, all providing a clear path for student success. The Second Edition has been made even more accessible and engaging with a streamlined narrative, expanded visuals, added coverage on the culture of daily life, and NEW History Skills Tutorials. Guides student reading in the text and online. Our most accessible version of the best-selling America family of books, the Essential Learning Edition simplifies Shi’s hallmark narrative while maintaining its lively storytelling style peppered with biographical sketches and fascinating anecdotes. Trimmed in length by 10%, the Second Edition delivers a sharpened focus on core learning objectives in the text, along with a richer art program for visual learners, that is extended online with the award-winning InQuizitive adaptive learning tool. The pedagogy in both the text and digital resources facilitates more than mere comprehension and summary. It teaches students to analyze and interpret key course objectives identified by the American Historical Association, The College Board, and state guidelines. These tools help students think like historians. With each new edition David Shi incorporates NEW cutting-edge scholarship on social, political, and cultural history that students find relevant. The new edition includes a wide range of updates with an emphasis on the “culture of everyday life”. Packaging Options meet the need of every course. The Essential Learning Edition’s exceptional value is further enhanced by an array of discount package options that permit instructors to assign, at nominal cost, supplemental works that serve their needs and interests.